The search for a good layout manager is over. 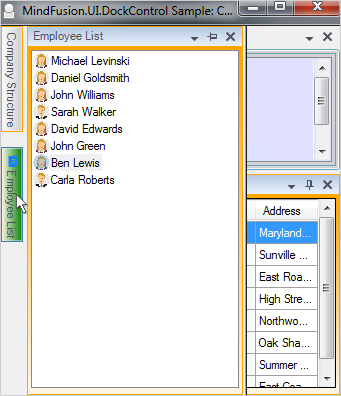 A WinForms layout control designed and developed to meet the high standards of your application. MindFusion Dock manager provides smooth and fast drag and drop functionality that makes it so easy to arrange and rearrange dock panels according to the user's needs at the very moment. The dock control updates dynamically its client area in order to render a correct preview of the presumable new location of the dragged window. The dock navigation arrows appear the moment you start dragging any of the dock items hosted in the layout manager. Every layout is performed seamlessly, without the tiniest delay. Each dock item supports a line of dock states that are easy to change as the user starts interacting with the application. 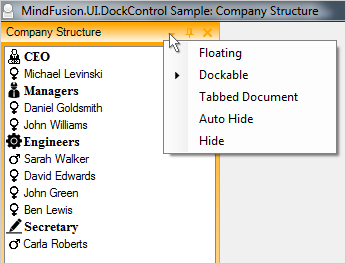 You can choose among a dockable window, tabbed documents or a floating panel. Another option is to set the Auto-Hide option that strictly emulates the panels of Visual Studio. Of course, you can hide the dock item completely. You believe that a great control offers not only great performance but also great design? So does MindFusion. MindFusion dock layout system was built to allow developers to customize every detail of the look and feel of the component. You can change the appearance of everything - from the dock handles to the header of the dock items. Dutifully documented, all properties are easy to find and easy to use - ready to help you build a market leading WinForms application. MindFusion Dock control aims to save you both time and effort. 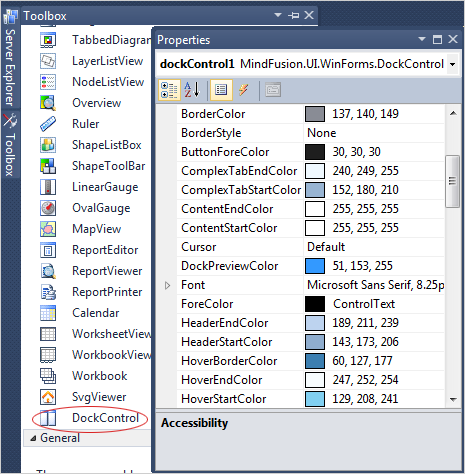 It integrates neatly into the Visual Studio toolbox from where you can drag and drop it as any other standard WinForms control. All its properties are listed in the property grid divided into categories and you can make full use of its WYSIWYG functionality. 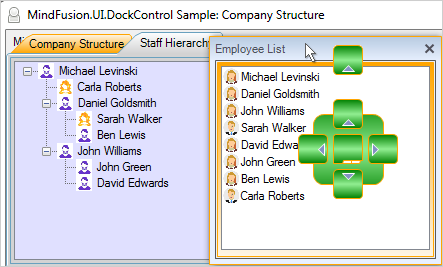 The time needed to create an elegant and flexible UI in WinForms has never been shorter.